This February in Fukuoka I met Moe Taniguchi, a 6th-grade girl (5th grader at the time) who attends Oouchi Elementary School in Yamaguchi City. My wife Noriko and I were traveling on vacation to Nagasaki, so we had the opportunity to have a quick dinner with Moe and her parents in a restaurant at the train station in Fukuoka. Moe has exchanged e-mails for over a year with a 4th-grade girl in Connecticut, and my wife translates the notes exchanged between the two. This summer Moe also started corresponding in Japanese with a high school sophomore girl in Connecticut to whom my wife gives weekly Japanese lessons. Moe's parents kindly invited me to visit her family's home and Moe's school. On the night before my visit to Oouchi Elementary School, the Taniguchi family organized a welcome party at a nearby neighborhood center. About 20 children from Oouchi and many of their parents enjoyed udon noodles, rice balls, and potatoes boiled in a pot over a fire built outside. One especially energetic five-year-old boy seemed scared of me when we first met, but by the end of the evening we became good friends and he enjoyed the "scary" rides I gave him by holding him by the ankles upside down over my back. I gave a talk to the children about the American holiday of Halloween, and they were exited to receive Halloween stickers and candy. At the end of the party, the children played with sparklers by lighting them with the fire previously used to cook some of the food. 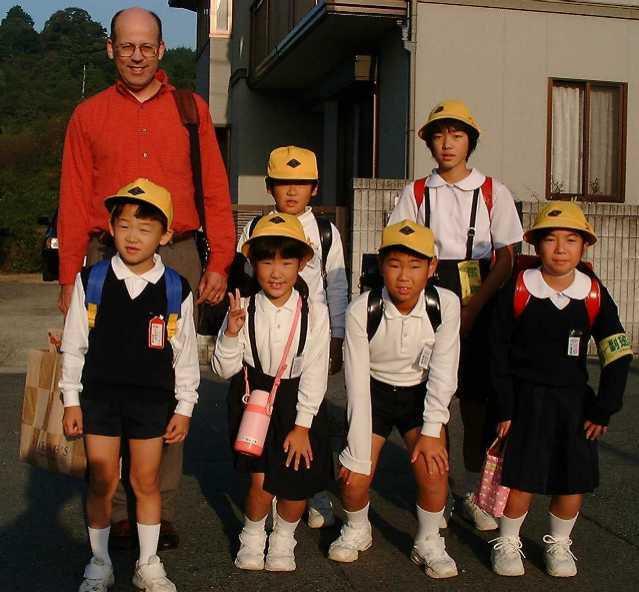 In the morning I went with the neighborhood children on their 15-minute walk to school. This school had a good system to ensure the safety of the children on their walk to and from school. 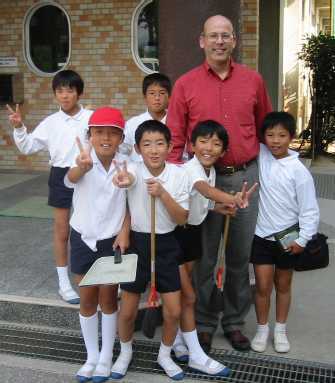 Maybe many other Japanese schools have the same system, but this was the first time I had ever seen it. The neighborhood children all gathered together at a street corner at about 7:30, and we walked single file along the side of the road, with one 6th-grade girl taking the lead and another 6th-grade girl walking at the rear of the line. I started at the rear of the line until I asked the girl ahead of me about the meaning of her yellow armband, when I found out that it meant her responsibility was to be at the end of the line to watch the others. So I jumped ahead of her so she could carry out her duty. Nobody talked with each other on the way to school, but I think two of the boys were still half asleep. As we neared the school, I could observe that the strict order of some of the other lines started to break down as some children started to run toward the school building, but our line kept in order until we reached the school grounds. I met briefly with the principal, but we were soon visited in his office by the 2nd-grade girl who I walked with to school and two of her friends. They invited me to their classroom, so I went upstairs to visit their classmates. That morning the 1st to 3rd graders were leaving the school soon to attend some special event, but I was surprised to find no teachers in any of the classrooms in this area of the school. Soon students in other classes invited me to visit their classrooms. Then before I realized it about 40 students were playing tug-of-war in the hall with me in the middle. In a minute or two I escaped, but it was no easy task, and I was glad to see one of the teachers come down the hall soon after I broke away. For the next three school periods, I met with each of the three 6th-grade classes to discuss several topics, including the multicultural, multiracial, and multiethnic aspects of America. After lunch with Moe's 6th-grade class, I went out to the playground for a game of dodge ball with the 5th-grade boys. I found out quickly this was not the same game I played in elementary school where everyone formed a circle around the people in the middle. We had 10 or 12 people on each side of a middle line with boundaries similar to a volleyball court. I figured out the basic idea of the game fairly quickly, but even by the end I did not understand all the detail rules of when and where people moved after being hit or after catching the ball. On Friday night, after my visit to Ohdono Elementary School in Yamaguchi City, I went with Moe and her friend to a badminton club, where about 15 adults and children practiced and played for an hour and a half. Although I played badminton quite often in college, I only have played about once a year since then, so it took me about a half hour for my body to remember the correct way to swing a racket and to stop making many unforced errors. At the end I joined a young man to play doubles against two women, but we lost a couple of games, mainly due to my play and my lack of knowledge of doubles strategy. I ended the exhausting but fun workout with my T-shirt completely soaked with sweat.